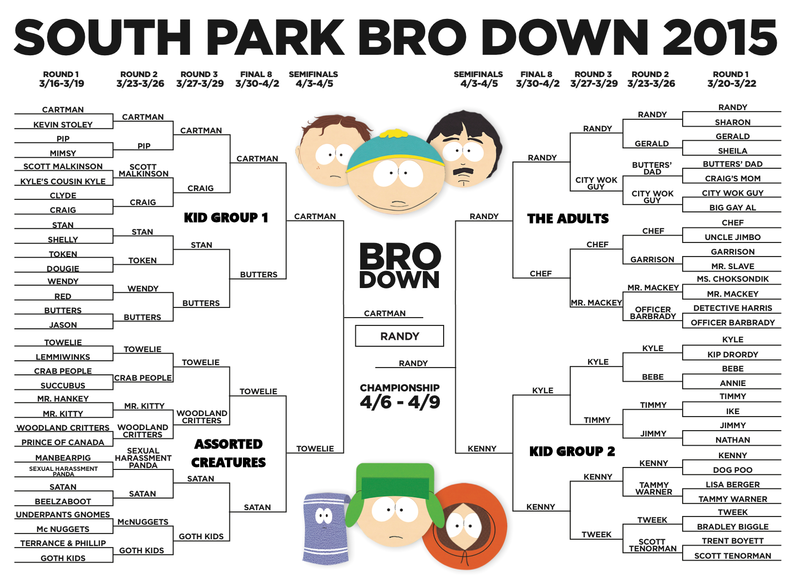 We need South Park Bro Down this year like in 2013 and 2015. You're mentioning this now, months after it would have come and gone? Maybe they decided to do it later this year this time. It's this site's version of March Madness, with the characters put into four different groups. It was known by two names, shown below. In 2013 the winner was Butters, announced April 14, took two weeks to determine the winner. This was South Park Sweet 16. In 2015 the winner was Randy, announced April 10, took a month to determine the winner. This was South Park Bro Down. There is no Bro Down or Sweet 16 this year. April - and March Madness - has already passed. Oh yeah. I remember South Park's Facebook page basically spammimg about that Bro Down. The 2015 Bro Down didn't split anyone into four groups.